Huge thank you to laton95, LexManos and tterag on the Forge Project Discord for helping me get started with Forge Energy. 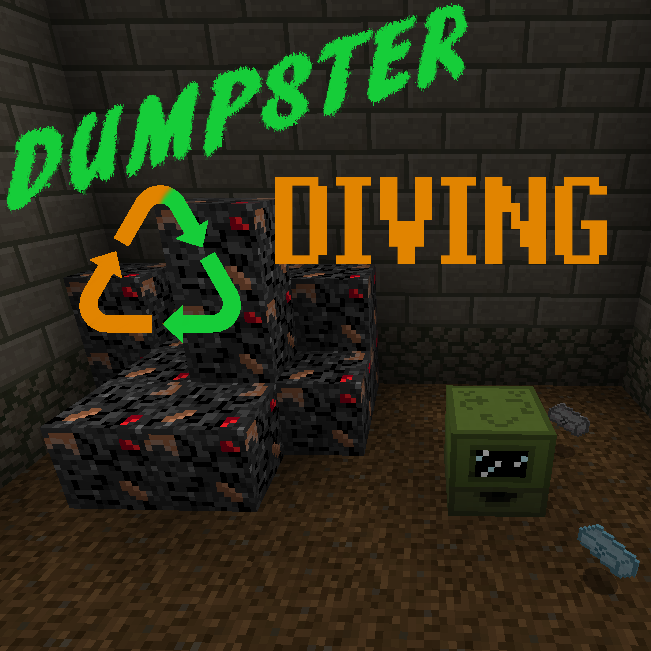 The 'Dumpster Diving' mod allows you to scavenge for useful scraps and rummage for salvageable resources by digging through the 'Garbage Blocks' that this mod adds. You can find a whole host of scraps that you will be able to process back into usable resources, including melting old cans back into tin ingots, processing old, worn out tires back into rubber, and breaking down broken circuit boards for their Redstone. You'll be able to salvage scraps to yield resources of Copper, Aluminum, Rubber, Tin, Leather, Iron, Gold and more! And all of these resources should be fully compatible with most other mods that use them! Where can you find these Garbage blocks to start collecting scraps and salvage? Two places, the first is the Landfill biome this mod will add to your world, that has it both scattered across the biome and buried under large, squarish mounds. But watch out for the Living Scrap Metal ZOMBIES that can spawn here! They're tougher than normal Zombies and don't burn in sunlight, but certainly worth taking down! Since they're hoarding some of the best stuff! 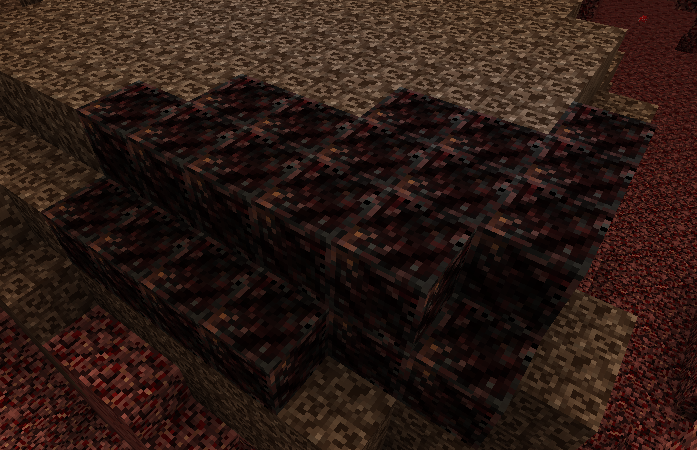 If you're feeling a little more adventurous, you can find large cashes of Charred Garbage Blocks in the nether due to hedonistic villages using the nether as a dumping ground. Charred Garbage Blocks have a more narrow, lucrative yield, including scraps only found in it. To get the most out of your salvage you'll want to craft the Repurposers! Which are fully compatible is JEI/NEI's recipe list. But I've only briefly covered the mod so be sure to check out the (Still in development) wiki! You have my blessing to use this mod in any pack, on any platform, or on any launcher. Technic, FTB, Custom packs of multi-MC ect. You may not host this mod for download from any other source except as part of a pack. Always link back to this page when sharing this mod with the intent that it be downloaded. Do not redistribute this mod unless as part of a pack! Link back to the curse Forge page. Like wise I advise my players not to download this mod from any other source. I had a similar idea to this mod but this looks pretty cool. You deserve more downloads. I love the concept of this mod! Very clever! I am going to use it in a waterblock (ex nihilo) modpack. Sometimes items don't stack properly when retrieved from the garbage blocks i.e. discarded conduits won't stack with others. Thanks for the config and I hope you keep updating and expanding on this mod! I have not implemented any configs yet... Anyway I was not able to re-create the non stacking bug. Is there a specific situation where they wont stack? And yes, I am still updating the mod, still have a lot of stuff I wanna do with it :3 Internet was down for a while as I was effected by a recent storm but I am back now. There may be 1 hic-up with that. Currently there is no way to farm tainted stone. Junkyard surprise food is pretty handy for skyblock though! And a lot of the junk can be processed by vanilla and other mods. One pack that runs my mod with custom generation gave it crafting recipe. I'll probably give the stone a crafting recipe in the mod itself specially to account for things like Skyblock or Stone block. You don't really need a renewable source for contaminated stone (but I shall crafttweaker that in just in case, likely just 8 stone and 1 rotten food or even junkyard surprise for 8). You just need an easily renewable source of garbage that can work in peaceful, and I'm using Trash Cube for that. There is a renewable source of garbage, in that the Living Scrap Metal drops them frequently. I was looking for something *exactly* like this. I always loved the wasteland biome from BOP, and this takes it to the next level. Do you have any plans to add structures or maybe pipes/pipe metal "trees." Or perhaps larger junk piles? Just very excited about this mod! I defiantly do want to make the biome itself more interesting! Like the new textures, and all the new content! 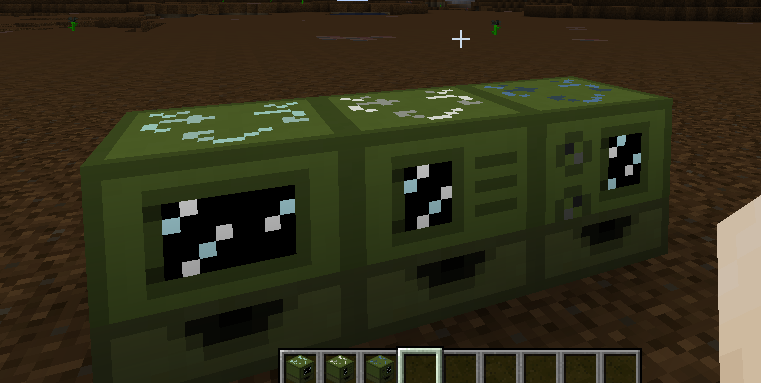 Would you be willing to add a discarded newspaper as one of the drops from the overworld garbage blocks? Could be ground down in the one repurposer to wood pulp, and another one could process it into paper? Paper is in fact one of the possibilities from Junkyard Surprise. I tried junkyard surprise as a reliable way to make paper, but with mods like spice of life, you can only eat so much before it doesn't add any value (becomes inedible) and then no more paper. An old newspaper could be used in re processor for 1 paper, and in re grinder for 1 wood powder? Since you made the machines use conventional fuels, more players are opting to convert rotting logs into charcoal rather than wood powder, decreasing the usage of particle board. Something like this could add greatly to someone who is attempting to survive solely in a landfill biome? Also it will dilute the drop table a bit, so dedicated scavengers wouldn't get too much resources? As a side note, would you consider adding a poisonus potato to the loot table for junkyard surprise? Thank you very much! This sort of feedback is very helpful! I actually have another plan for poison potato but perhaps. I do plan on versions of each of the machines that use a form of energy which would decrease the need for fuels. It could be worth noting that 6 of the partial board blocks can make 16 panes which are also accepted as fuel but not as planks. Now that the Garbage blocks can be 'farmed' in a sense by killing Living Scrap Metal I'm not too, too worried about adding to it. I'll certainly conciser. Some guys prefer to only scavenge during daytime, and run away at night because I use tech guns as well, and at night the landfill biome is quite dangerous because of a lot of armed zombies with guns... I get about 10 max scrap metal zombies per night, about +-20 scavenged garbage blocks? Btw, is a plexiglass shard only available as a scrap metal zombie drop? Good choice! I think my mod fits really well with tech guns! And atm yes. My reasoning being that the process for making hardened glass is usually a little more involved so I felt I should give it a bit of cost in the form of fighting the Living Scrap. The feedback is great! The biggest information I was looking for with the beta build is things like this: What feels too hard, what feels too easy, what things feel like one choice is always better. Care to hop into my Discord? I have noticed some grammar errors do you need a hand with that? One is in this page in the comment on Charred Garbage Blocks.